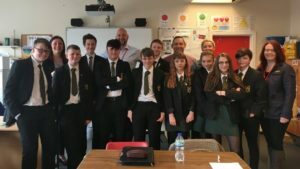 Two Directors from Innova Solutions Ltd have been back to school recently as part of a mentor programme run by Education Business Partnership (NW); EBPNW provide inspiring solutions to help and support young people and adults. The programme helps to improve local teenagers’ employment prospects, develop essential life skills and enable them to self-manage their future. In addition to co-ordinating work experience programmes, EBPNW also work with 7 schools across East Lancashire delivering an Employer Led Mentoring Scheme which is sustained by The Careers and Enterprise Company, who are a Government backed organisation supporting over 20,000 students in England over a two year period. This is where Innova Solutions’ Glenn Dunleavey, Managing Director and Linda Barrowclough, Operations Director stepped in to offer their skills and time to this vital cause. Education Business Partnership (NW) is an essential addition to a young person’s path towards a well-informed, self-assured and fulfilling career. Innova Solutions look forward to mentoring the next group of youngsters on their journey.